A right turn at the end of Macrossan Street will take you onto the esplanade of the famous Port Douglas Four Mile Beach. 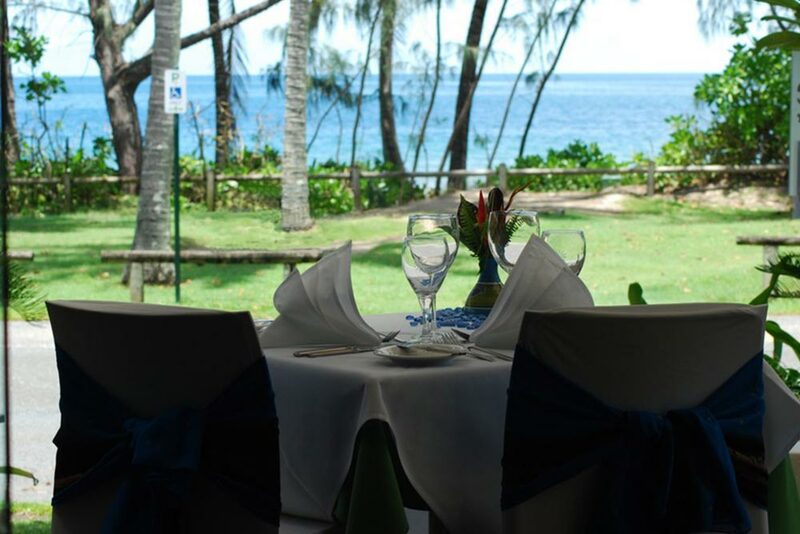 100 metres along the esplanade sits Hi Tide Beachside Restaurant – open for breakfast lunch and dinner seven days a week, Hi Tide delivers on the unbeatable combination of amazing scenery and delicious food. At Hi Tide you can drink in the sight of the picture perfect views of the turquoise waters of the Coral Sea complete with the swaying coconut palms that fringe the beach. Hi Tide captures the gentle ocean breezes and offers an array of dining options. The casual, open and modern setting of Hi Tide Beachside Restaurant is perfect to eat, drink and relax in the balmy tropical climate. Hi Tide has done justice to the freshest, tropical produce from the sea and surrounds that we have right on our doorstep in North Queensland. Hi Tide Beachside Restaurant showcases these ingredients through the development of seasonal menus. Hi Tide Beachside Restaurant has recently introduced a fun and healthy new concept called Stonegrill for dinner service. Stonegrill dining enables guests to freshly grill prime steaks, meats and seafood to their personal taste. Hi Tide Beachside Restaurant sources the highest quality cold country beef from Tasmania as well as local fresh meats from the Atherton Tablelands for the Stonegrill. Stonegrill is a a 400 degree hot volcanic stone brought to your table ready for you to “cook your own way”. Grill until succulent and the way you like it, while enjoying a cold beer or refreshing white wine. The Stonegrill is designed to stay hot for at least half an hour which gives you time to enjoy your meal and truly relax. The breakfast, lunch and dinner menus of Hi Tide Beachside Restaurant present a wide array of favourites. A very popular venue with the locals, it is always best to book in advance for lunch or dinner. This entry was posted in Food, Port Douglas News, Restaurants and tagged beach views, Fresh, romantic, seafood, steak, Stonegrill.